Do you remember the chor, raja, wazir, sipahi game? From the excitement to become the King to the stupid tricks of holding ear and finding out the truth, it was just a fantabulous game. Alas! Now it is lost in time and the kids do not play it anymore. Like this game, there are many other exceptional things which are just history in present. One of those things is stepwell. When the Britishers reached our thresholds we were not only slaved by them but also the modern techniques took over the traditional ones and stepwells lost its glory. However, our ancestors built these stepwells with such perfection that the artwork still glorifies India. One such stunner is, Chand Baori situated in Abhaneri village, Rajasthan, a stepwell which is the mesmerizing geometrical wonder of India. Let’s check, can you escape the hypnotism of Chand Baori, A Mystical Visual Maze? Rajasthan, a state which is adorned with many spectacular forts and palaces, hids one more marvellous architecture into its realms. Chand Baori, an impeccable fusion of geometry and human expertise, may not be much known but this stepwell is much more than the reservoir of water. Dating back to 9th century, Chand Baori is one of the oldest, deepest and extraordinary stepwells in the world. Just imagine the sheer amount of hard work in constructing the 13 stories deep stepwell with 3500 steps! I just wonder King Chandra of Nikumbha Dynasty must be having a prodigious vision that is why he was able to commission the construction of this stepwell. Apart from serving the basic purpose of providing water in water-scarce land, Chand Baori embraces exquisite sculpting as well as beautiful paintings. While the three side of the well looks like a hand-woven tapestry engraving geometrical design in 3D effect, the fourth side is emblazoned by the abode of the royal family. I cannot stop my mind from forming the pictures of those days when this well was in its golden days. Living in the ambience of water would have been amazing. You have to come to visit this phenomenal stepwell and I bet you would be in reveries after visiting Chand Baori, a mystical visual maze. Chand Baori is an exceptional symmetry to visualize but this stupefying beautiful architecture was made to house water that is sought as the boundary of heaven and earth in India. In the scorching heat, this stepwell was like an oasis where locals and travellers could get the water for their daily needs. But constructing it in such a fantabulous way was like enriching their overall experience and leaving a mark of the exemplary architecture. 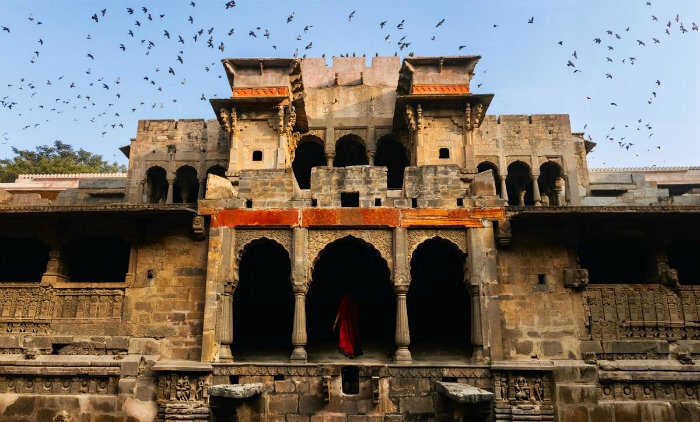 However, as it is hard to be perennial, Chand Baori also became dysfunctional with time and daunting silence, fluttering pigeons and frightening bats became the part of it. But this in any way does not fade the beauty of this visually spectacular stepwell maintained by Archaeological Survey of India. No matter how old, it is still is a wonder and movies like The Fall and The Dark Knight Rises have successfully captured the beautiful Chand Baori, a mystical visual maze. Blame it on “The Horror Show” or ‘Aahat” when we see something dark, deep and unpredictable we tether some uncanny emotions with it. Maybe that happened with Chand Baori too as this wonderfully architectured stepwell looks like a hypnosis spiral when you see it from above that is why I call it a mystical visual maze. So there are some haunting stories related to this wondrous stepwell. Some say that they have experienced an otherworldly supernatural power like a djinn. And let me tell you this is just not an unfathomable idea. Many of the visitors who dared to step down into this virtual maze had some strange and freaking experience as told by the guide there. He told that the ghostly power allows you to descend but does not let you ascend the same stairs and you are trapped in your own anxiousness, unable to climb up. Did I give you the heebie-jeebies or your head is just cooking up the next dare for your friends? Horror is an adventure though! Have you ever felt a peculiar tickle on the base of your foot when you are about to fall or when you stand at the edge of some height? You will feel the similar tickle when you step into Chand Baori, a mystical visual maze. The awe which grasps your heart seeing this mathematical perfection is worth packing your bags and planning a trip to Abhaneri, Rajasthan. 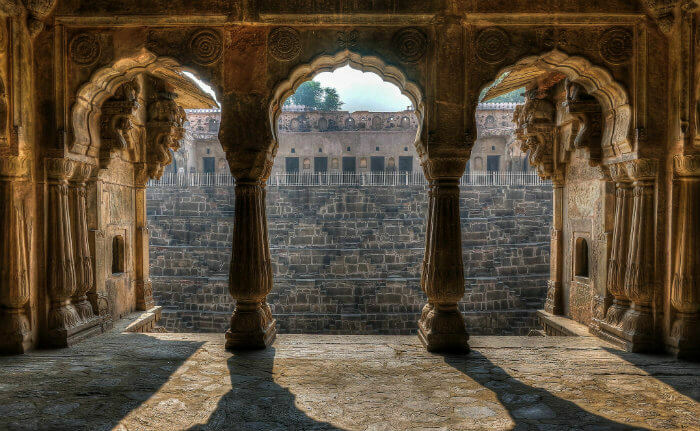 But let me warn you beforehand many of your conversations after coming back from Chand Baori will speak only one travel story that is about this magnificent stepwell. 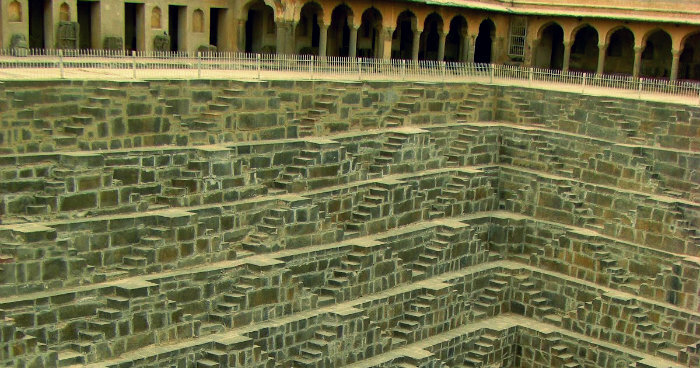 So, Can you escape the hypnotism of Chand Baori? Do you dare? Chand Baori is situated approx. 100km away from the heritage city of Rajasthan “Jaipur” and very convenient to reach. By Road: Jaipur is well connected with the major cities and towns by road. To reach Chand Baori you can take a jeep or a taxi from Jaipur which takes about a 90min to reach. By Rail: Jaipur is the major station to reach Chand Baori which is well connected to the rail network from across India. If you still further want to travel by train then from Jaipur you can take a train to Bandikui. By Air: Closest airport to reach Chand Baori is Jaipur airport which is well connected with the major airport across India.